In the days before mechanisation and automation to unload bulk sugar, sugar came to the Chelsea Refinery in 2801b. sacks. These were packed like concrete in the ship’s hold. Anyone who scoffed about how lazy the wharfees were only needed to do a session of seagulling with them to realise how backbreaking the task really was and how skilled they were in freeing the tightly packed sacks and making up a slingload to gradually empty the ship. 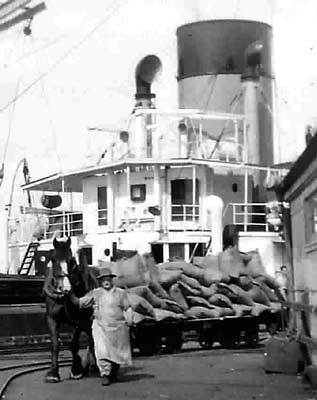 Each slingload was raised by the ship's steamwinch and swung over the side onto rakes, which were flattopped wagons and ran along on rails from the wharf to the refinery rawstore where each sack was precisely placed in stacks up to thirty feet in height. 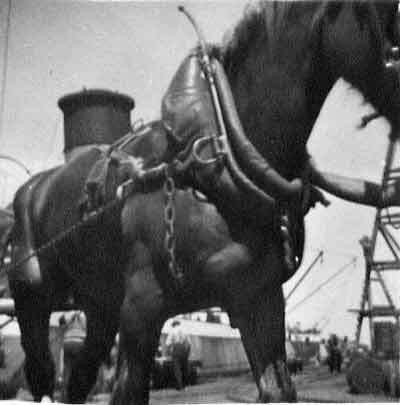 A giant heavy draught horse pulled each rake. These animals were magnificent beasts who knew exactly what was required of them in spite of the fact that each was tended by a senior workman. 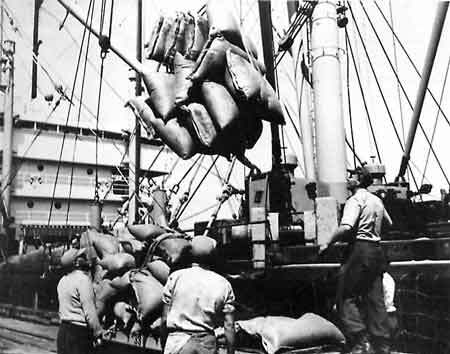 As each slingload was positioned on the rake a company man, by the name of Johnny, used to take a number of samples from the rakeload with a sampler which was stabbed into the sack, given a twist and withdrawn with the aforesaid sugar sample. As there is a proportion of syrup in raw sugar his implement would get clogged up if not washed often in a bucket of warm water. When the water cooled a bit, Johnny would empty the bucket on the wharf decking to immediately drain into the sea below and get a fresh supply from a nearby hot tap. Now the wharf was of wooden construction. Originally built when timber was plentiful there were beams that were forty feet long, eighteen inches deep and six inches wide; beautiful heart kauri with an even straight grain. The deck timbers, hardwood, were nine by four inch planks nailed onto the beams by huge spikes, Unfortunately, the size of the spikes tended to split the grain of the kauri which let the water in to rot the upper inches of the eighteen inch beams. As the four-man wharf maintenance gang, our job was to remove damaged beams, and replace them with Australian hardwood beams. Sometimes this was done while the wharfees worked unawares above. Our little gang included Joe who wasn't very big, but had a voice out of all proportion to his size. His vocabulary wasn't extensive but made up for that lack with enough colour to make sailor blush. He had spent some years at sea on a lighthouse tender. There was a rumour that he was used as a human foghorn on occasions, but he never admitted it. He was quite competent in his job and I learned to splice seven strand wire cables with his tuition. On the particular day of our little story we were working from a flat topped punt which was manoeuvred by hand on the water around the wharf piles, stays and struts which formed the understructure of the wharf. Joe spotted a dodgy beam and decided to climb a stay to get a closer look. He gained his objective and clung with one hand while jammed up against the underside of the decking as he probed the beam for soundness with an old screwdriver. He was just pronouncing judgement on his inspection when a flood of liquid poured through the decking drenching him instantly. Immediately he reacted with a roaring and bellowing that must have startled seagulls on the other side of the harbour. It is a wonder that Johnny's ears didn't disintegrate into ashes instantly; only he was up delivering samples to the refinery laboratory. The torrent continued regardless. Joe then performed a feat of agility humanly impossible in ordinary circumstances by shinning along a crossbeam and up over the coaming of the wharf to gain the deck. He then performed a dance and vocals that would have stunned a full haka team to shame. All the wharfies stopped work and even those on the ship came ashore to investigate the rumpus. On realising the situation every-one immediately fell about in hysterical and uncontrollable laughter. Just behind the performing, sodden, soaked and drenched Joe and right above where he was so suddenly soused and showered resuming her usual dignified posture was Bess, a matriarchal mare who had chosen that spot to relieve her large and capacious bladder.